Fruit Ninja first took the mobile gaming world by storm back in 2010 with its beautiful graphics and fast finger swiping action. 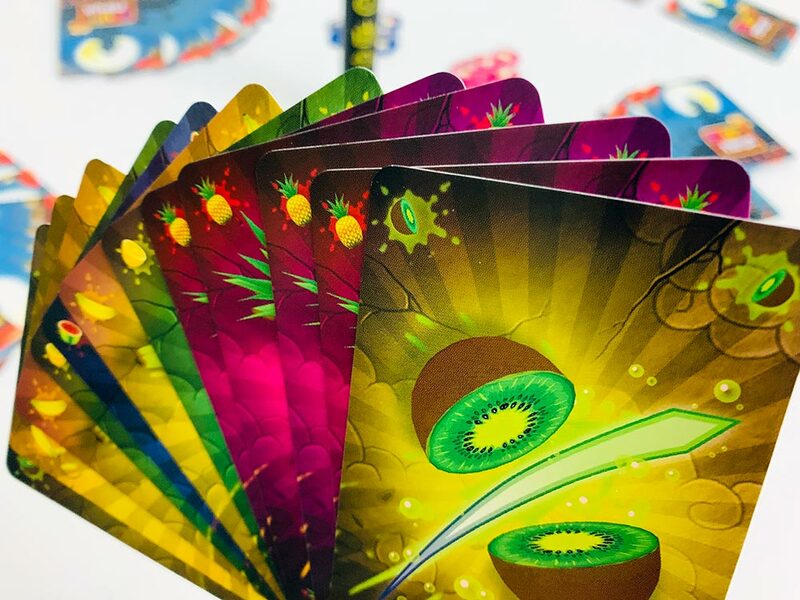 Fast forward to 2018, designer Julien Vergonjeanne and publisher Lucky Duck Games have brought it to your table with Fruit Ninja Combo Party. Three to six players draft cards and push their luck to slice up the biggest fruit combos. Place the katana handle, reward deck, fruit deck, and sorted tokens within reach of all players. 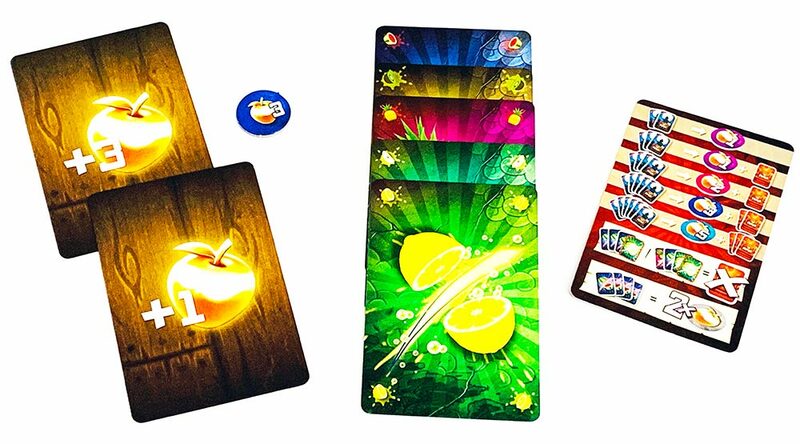 Deal twelve fruit cards to each player. 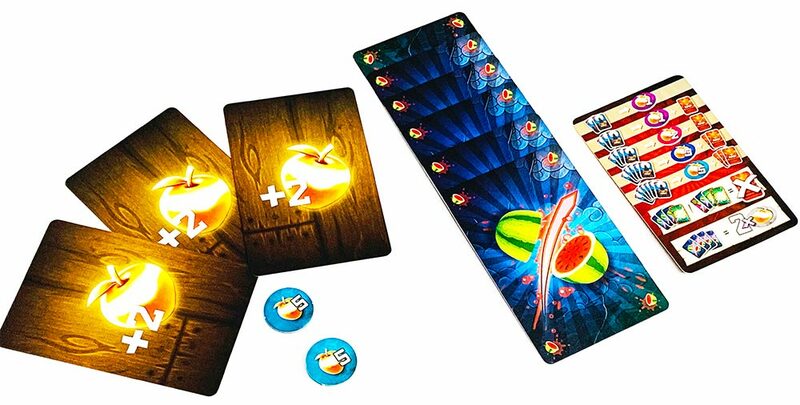 Fruit Ninja Combo Party is played over the course of four rounds where players draft cards and score combos in phases. In the Fruit Phase, players draft a fruit from their hand of cards and then reveal together. If two or more players reveal identical fruit cards, they must try to grab the katana handle. The player who grabs it first draws a reward card that gives them bonus points. Players that fail to grab or lose the tie breaker get a negative one-point token. Next, players add the fruit card to their combo pile. There are two types of fruit combos: Multi Fruit Combos consist of different fruits whereas Unique Fruit Combos are composed of entirely the same fruit. If players continue their combo with the fruit card they’ve played, they can push their luck and continue. If the fruit card doesn’t continue the combo, they must score their pile. Players enter the scoring phase when they stop their combo (either by choice or by playing a card that does not fit). The player takes the appropriate amount of apple golden apple tokens and may also draw a reward if indicated on their scoring reference card. For example, a player who scores a Multi Fruit Combo containing a watermelon, kiwi, pineapple, pear, and lemon would receive a three-point golden apple token and two reward cards. A six card Unique Combo scores two five-point golden apples and three reward cards. Because Unique Combos are so difficult to achieve, they give a double token bonus. When players have only two cards in hand, they play one and discard the other. They must then immediately score combos and track total points earned in this round. Before the next round begins, tokens are returned to the general supply, cards are discarded and re-shuffled. Players deal twelve new fruit cards and game play continues until the end of four rounds. At the end of the last round, the Ninja with the highest point total becomes the Combo Master and may continue their journey to become a legendary Ninja. Fruit Ninja Combo Party plays just as fast as its app namesake. It’s quick to teach, and rounds blaze by as players draft fruit cards for epic combos. The toughest decision in the game is choosing to go for a Unique or Multi Combo when selecting a second card. The katana grab adds a competitive way to score extra points, but you’ll need ninja-like reflexes to analyze cards and grab it quickly. The real challenge is being able to see all cards as everyone rushes to grab the katana. It can be frustrating trying to see what’s down as cards are easily obstructed by players arms. We’ve come up with creative ways to solve this by having players flip with one hand and reach to grab the katana with the other. If this becomes problematic for your group, simply leave out the katana handle and scores will be slightly lower. 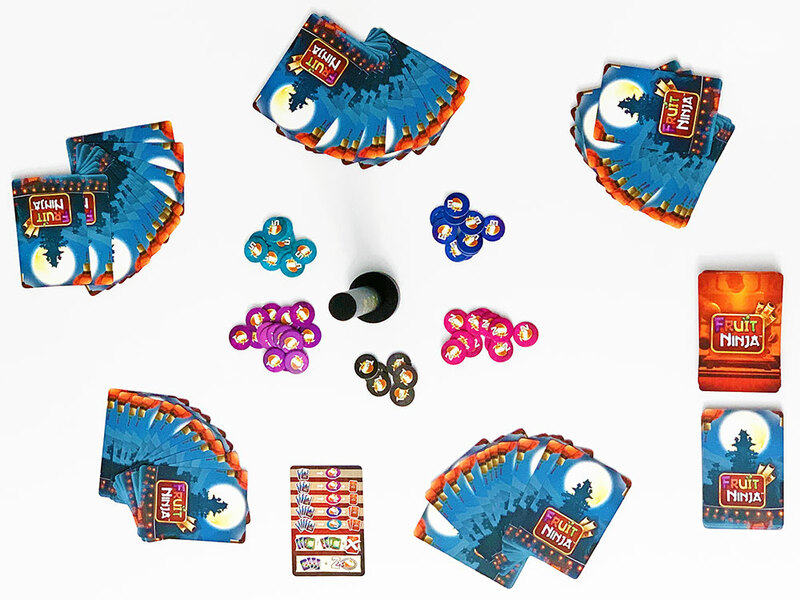 Fruit Ninja Combo Party is a light gateway filler style game that can be played when you’re looking to squeeze in a quick play or in between main events during a game night. It really sings at higher player counts. You’ll see more cards pass by and be tested trying to remember hands as they make their way around the table. With more players, you’ll have a better shot at making Unique Combos as well. Best of all, Lucky Duck Games made the game completely language independent. Fruit cards have no text and the iconography on the reference card makes scoring a breeze (although it’s a little hard to read for us older folks). The game play is perfect for families with younger children. Kids only need to understand the two types of Combos and know when to stop slicing to score. Fruit Ninja Combo Party is a fun, light-weight party game with simple rules for family friendly play. Its sweet spot is at higher player counts where there are more hands of fruit to draft from. If you enjoy light card drafting games like Sushi Go, this will be right in your wheelhouse. I’ll definitely continue bringing it to meetups and busting it out with larger groups of friends. Look for Fruit Ninja Combo Party at your friendly local game store, or buy it on Amazon. 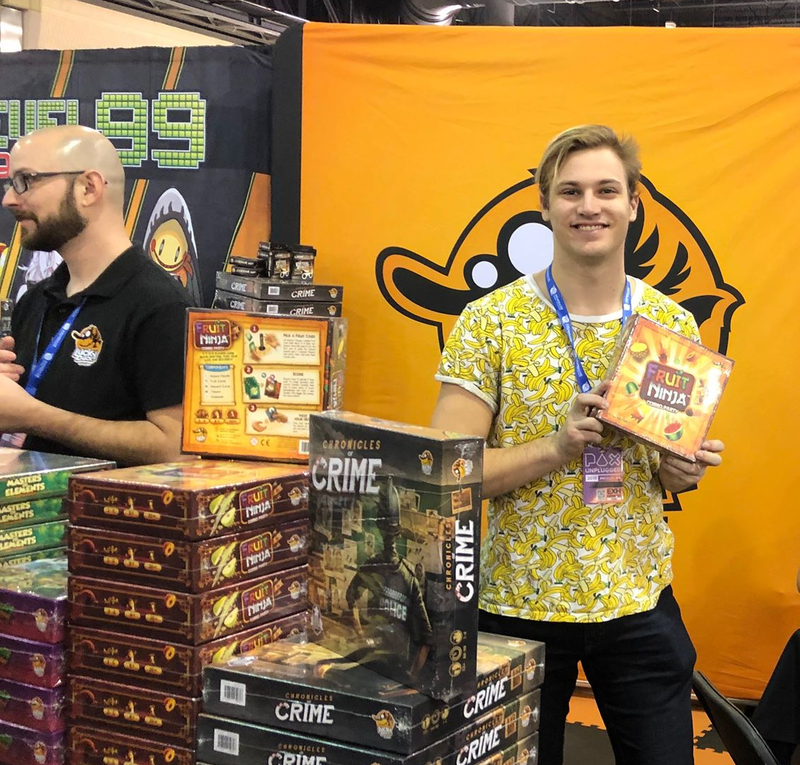 Fruit Ninja was a hit at PAX Unplugged 2018! The Family Gamers received a copy of Fruit Ninja Combo Party from Lucky Duck Games for this review.